Cima di rapa translates as “turnip top” and in essence is a turnip green that makes a small head (although some are “senza testa” or without a head). This is a very popular vegetable in Italy, especially in the South. There are an enormous number of varieties. The most common are Quarantina, Sessantina and Novantina (40, 60 and 90) for the number of days it takes for the particular variety to mature. There are also 120, 130, and 150 day varieties. In general, the shorter the number of days to maturity, the smaller the plant and the ‘cima’ or head of the plant. Quarantina generally get to be 12 inches or so tall; Novantina is usually 18-20 inches tall. The photo on the left is Quarantina. Below right, Sessantina Riccia di Sarno. Most of the Italian seed companies north of Rome sell three or four varieties (usually the 40, 60 and 90 day types and maybe something else). A southern Italy seed company would have at least 10 or more cima di rapa: the common ones, maybe a 150 day, plus some varieties from the area where they are based; they may be something like the sel fasano types (from the fasano area in Puglia) or they may call them ‘cima grossa’ (large head). There is also an ‘olive leaf’ cima. 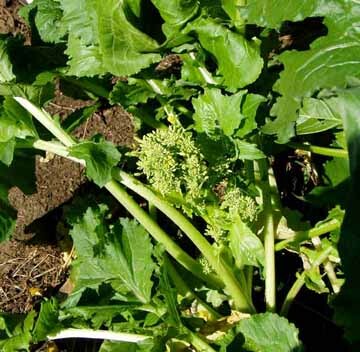 If it is not confusing enough that there are 10-15 varieties of cima di rapa, the southern Italian seed companies make it more so because they also sell a leaf broccoli that is grown for its tender leaves and sometimes for the tiny brocoletto heads that form. These come in a smooth leaf (“liscia”) and a curly leaf (“riccia”) although in truth there are infinite variations from one area to another. The names vary also depending on where you are: some of the more common names are spigariello (at left), getti a Napoli, and cavolo broccoli. Cima di rapa is easy to grow if you follow a few simple rules. First, you can grow it at any time of the year. You do NOT have to grow it in cool weather. They actually do better in the summer in the Northeast U.S. because flea beetles are a real problem for cima di rapa in the spring. In southern Italy, they are planted in late summer and are harvested through the mild winter (that is the reason to grow varieties with different days to maturity: plant them all at the same time then harvest for months). Grow it that way if you live in an area with Mediterranean climate or with mild winters. In zones 6 through 4, they do very well if planted in summer or late summer. (Getti a Napoli to the right). Cima di rapa needs to grow unchecked, so make sure you do a few simple things. Provide a regular amount of water. You need relatively fertile soil. Direct seed (transplants usually will bolt and are just a waste of time since it is such a fast grower.) Sow seeds in rows spaced 12" apart. Try to space a seed per inch, but it never works out that way since the seeds are tiny. No matter. It will be up in three days or so. Thin it a week or two after it germinates. 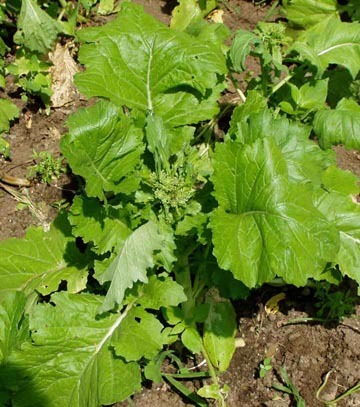 At this stage, it grows fairly quickly and you will have to make a final thinning to 4-5 inches apart for the 40-day variety and 6 inches apart for the 60-day variety. You could even go a little more. If you do not space your plants well, I can guarantee they will be small, spindly and will go to seed pretty quickly. 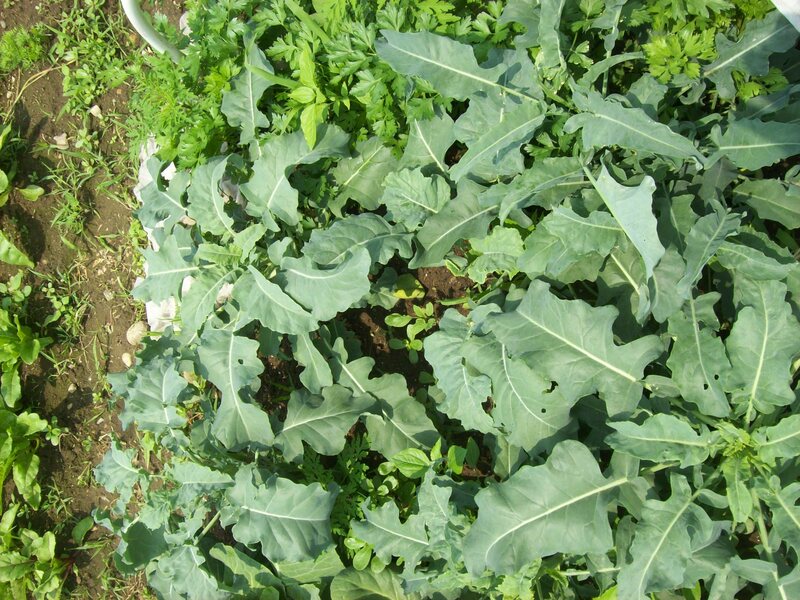 If you are a farmer, there is no need to do two thinnings; I just do it that way to get some greens for the salad and also to guard against loss to the small plants from bugs and woodchucks. At this point, it grows very quickly. All you need to do is make sure it is well spaced and has a good supply of water. The trick now is to keep it growing quickly. The 40-day variety should be ready in 25 to 30 days, depending on the weather. The 60-day variety should be ready in 35 or so days. In Puglia I am told that folks prefer to harvest & eat only the heads and I have to admit they are really good by themselves. As soon as the head is fully formed, just reach in and snap it off. You should get the head and four inches or so of really tender stem (absolutely no strings, tender and crunchy). If you leave the plants in the ground after the initial harvest, you will get side shoots; they grow very quickly so check every day. You could also cut the entire head and eat the leaves as well. They are very tender and tasty. Note for farmers. If you sell by weight, you are better off cutting the entire plant, trimming off some of the really big outer leaves. It is probably more trouble than it is worth to bother with harvesting side shoots if you have a big patch of cima di rapa. Also, consider the fact that it takes 35 or so days to grow the 60 day sel fasano to maturity. 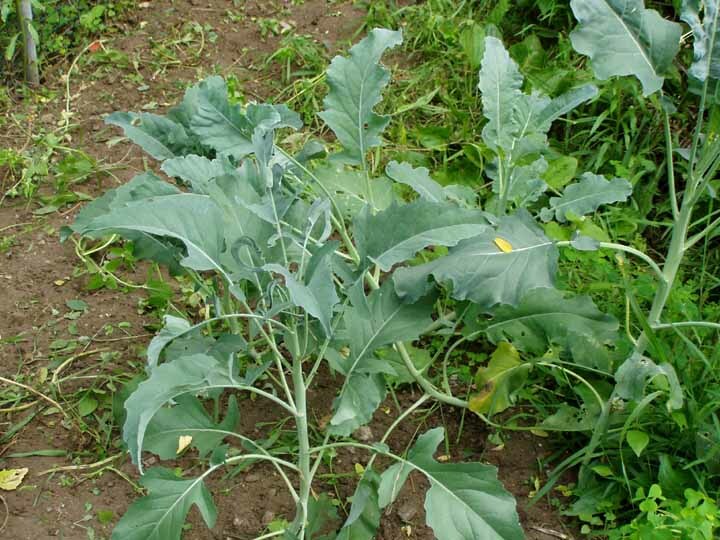 A single plant, well trimmed, weighs five or so ounces so you only need three or four plants to the pound. 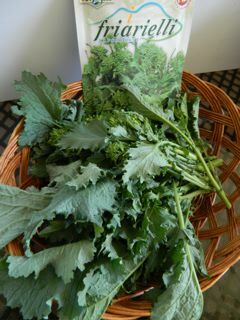 My brother the farmer says this is very good (his motto is weight is good) and has become a convert to cima di rapa. The leaf types (spigariello, etc.) are grown pretty much like broccoli. You can direct seed them or use transplants. Space them 12-16 inches in the row, 12 inches between rows. You can set them out any time during the growing season; since you are not growing them for heads, you do not need to worry about temperatures. They will get 18-24 inches tall. Harvest by cutting off the leaves; the more you cut, the more they produce. Last year I had some that the woodchucks got to; they were munched down nearly to the ground, then the red tail hawk and the coyotes got the woodchucks and they regrew into beautiful plants. (Cima Grande to the right). Put the heads and leaves in a plastic bag and store in the refrigerator for up to 10 days. There are lots of ways of cooking it, but the standard treatment Italians give to greens works fine for cima di rapa also. Put the cima di rapa in a pot of boiling water and cook until it is done (In Italy, done means well done; none of this crunchy texture to vegetables). Remove it from the water, drain it. Save some of the cooking liquid. When cool, chop into smaller pieces. Put some olive oil in a pan and heat it; add garlic to taste and a pinch of red pepper. Add the cima di rapa and cook until the flavors are melded (you might add an anchovy or two before you add the vegetables). You can also add some minced onions and/or pine nuts when you are cooking the garlic & pepper flakes. Add some of the cooking water you saved. Take it off the heat & serve as a side vegetable (maybe add some good grated cheese). I like it on top of freshly harvested potatoes. In Italy they often use it together with pasta. After you cook your cima di rapa, cook some pasta (try a short type like penne or orecchiette. When done, drain, add to the cima di rapa and cook a few minutes to meld the flavors. Make sure there is some cooking liquid on the bottom of the pan; remove the pan from heat; add freshly grated cheese and stir well. You should get a bit of a cheese sauce. There are infinite variations. I know people who eat it with cooked sausage. Some cook it with the sausage and then add pasta. For the spigariello, it is really good just cooked on the stove. Wash the leaves and leave some water on them. Put some olive oil in a pan, add some garlic and red pepper. Add the broccoli leaves. Cook until well done. Serve as a side dish.